As we wave goodbye to 2017 and embark on 2018 I’m feeling positive. 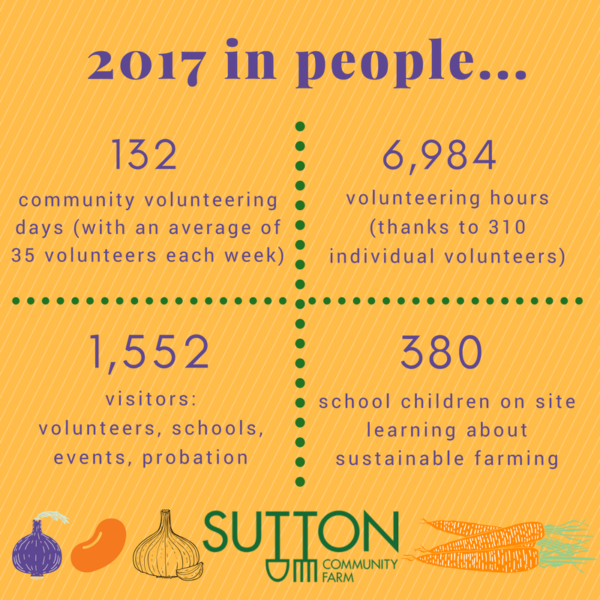 It’s been another successful year at Sutton Community Farm and I’ve tried to bring that alive for you in the photos below. 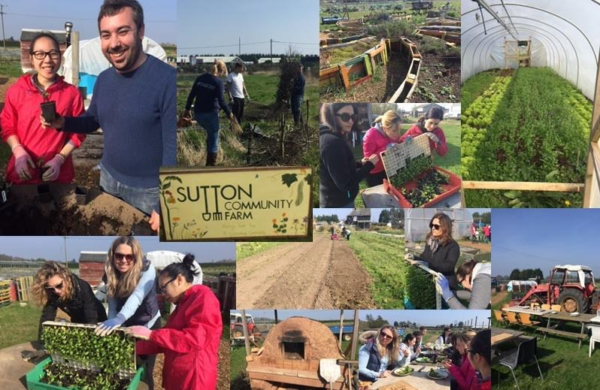 On an almost daily basis I’m bowled over by what our volunteers, Members, customers, partners, funders and friends put into making Sutton Community Farm the thriving, productive, welcoming place that it is. Together we are a powerful exemplar of how a local, sustainable food system can work. Yes, we have our challenges and it’s certainly not easy but as a collective coming together on one small patch of land in Sutton we are taking a stand. We are taking a stand against a broken industrial food system and putting our efforts and passions into proving that another way is possible. We are farming in a way that is fair to people and planet, and distributing fresh, healthy produce to local south London households. There are many others like us, and that’s why I’m feeling positive. Although we are small drops in the ocean of industrial agriculture, there are indeed more and more of us. 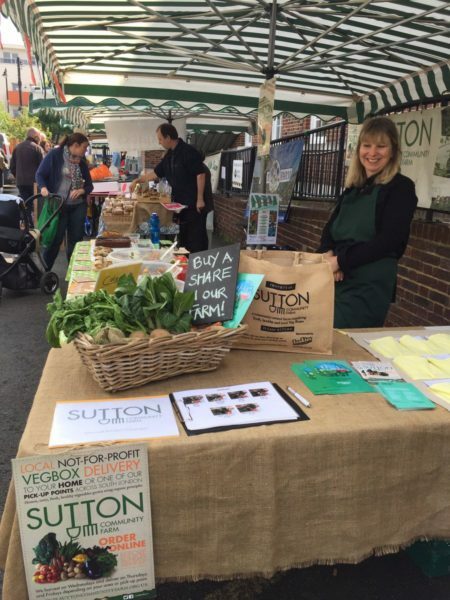 In these interesting times at the dawn of 2018 I’m proud and truly humbled to have participated in the last six years of Sutton Community Farm’s success. And proud to be part of a burgeoning movement towards a better farming future. Long may it continue! It was a quiet and cold start to the year. Time to plan and get ready for the busy months to come. 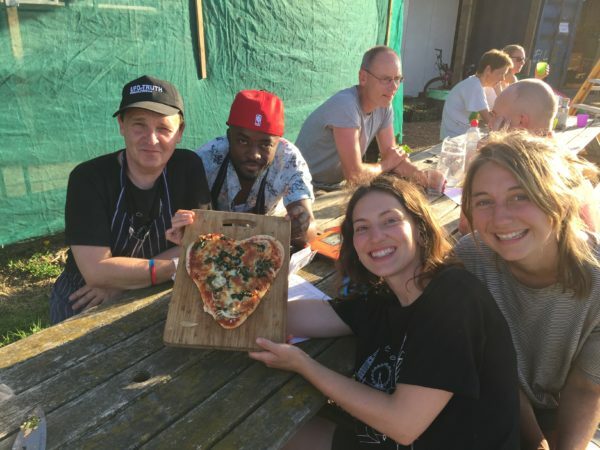 In March we welcomed in Rachel Clark as our new Growing Apprentice and hosted a 2-day permaculture course with Social Landscapes. 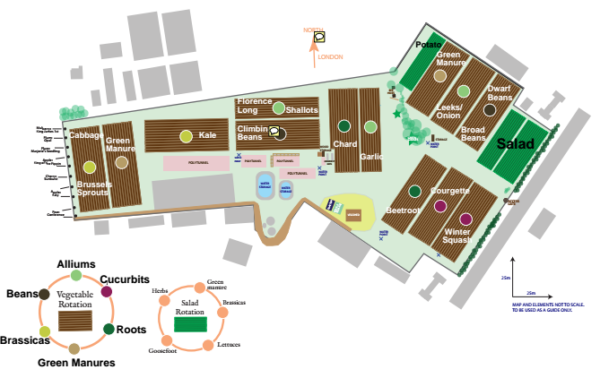 Winter is a time for planning the season ahead – here’s our 2017 site map and cropping plan. 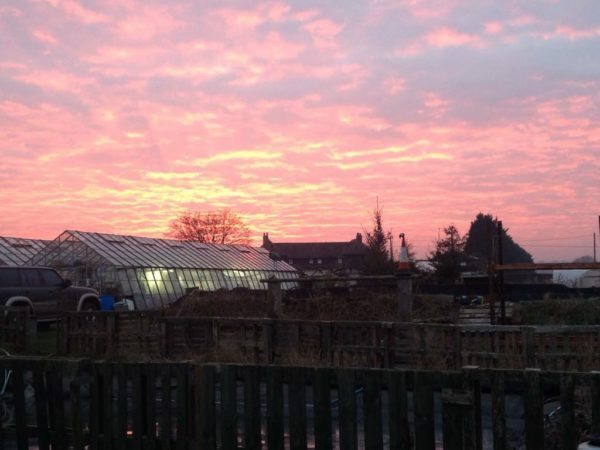 A January sunset on the farm. 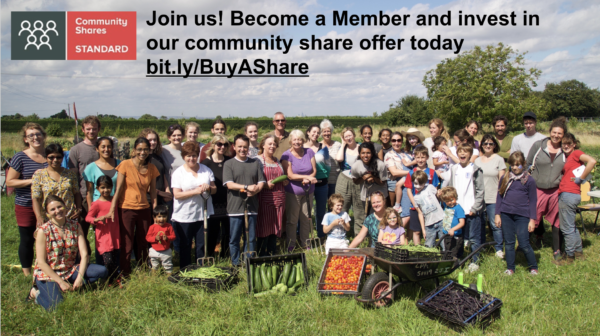 We launched our second community share offer to raise much needed funds to build a new barn. After a busy and exciting campaign we raised over £97,000 (including match funding from Power to Change via the Community Shares Booster Programme). Watch our film from the campaign below. Spring on the farm is a busy place with people and plants enjoying the sunshine! Our first Buddy Training session took place enabled with funding support from City Bridge Trust. We now have three bee hives on the farm. 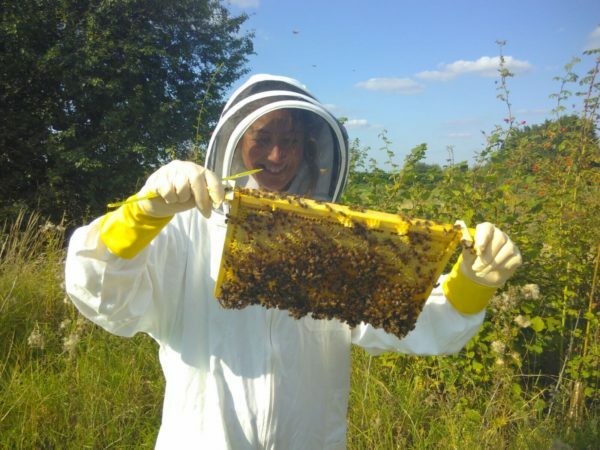 Bees are vital pollinators and we’re delighted to be looking after three precious colonies. In June we said a fond farewell to Harley Wright and wished her well on her travels with a pizza or two. We welcomed Sonia Cropper to the team as Community Engagement Coordinator (a post supported by funding from The James Trust). 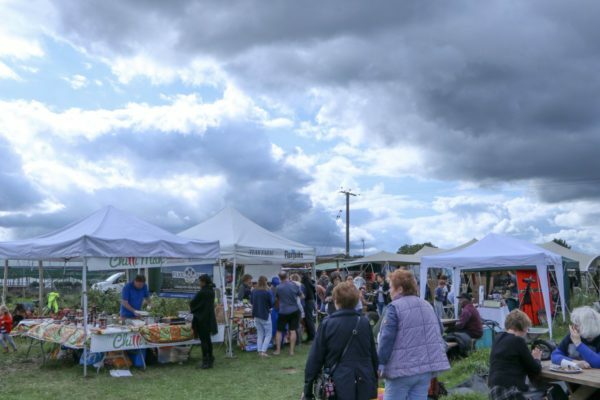 Summer is a busy time for markets and Pavlina hit the streets and parks of south London with a dedicated crew of volunteer helpers to promote VegBoxes, volunteering and share sales. Hosting young people on the farm is very important to us – showing city kids how fresh vegetables are grown and engaging them with healthy eating through cooking and eating together. 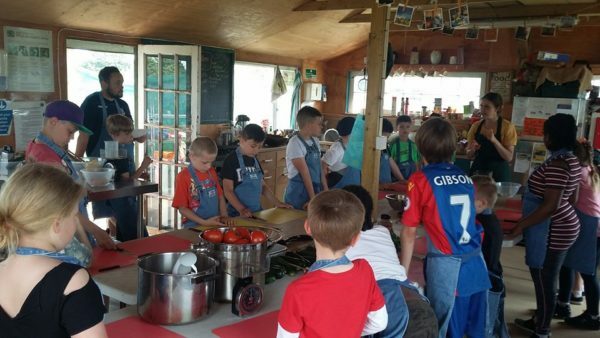 Read all about our work with Palace for Life Foundation bringing more kids to the farm to grow, cook and eat healthy food here. 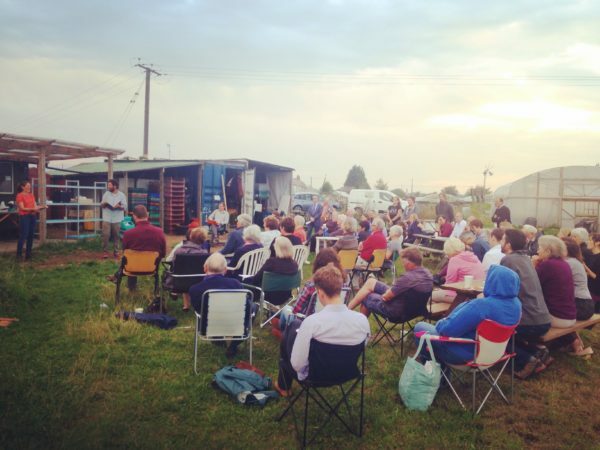 A mid-August evening and over 50 Members attended our Annual Members’ Meeting to catch up on the farm news, vote on key decisions and elect in new representatives to the Management Committee. 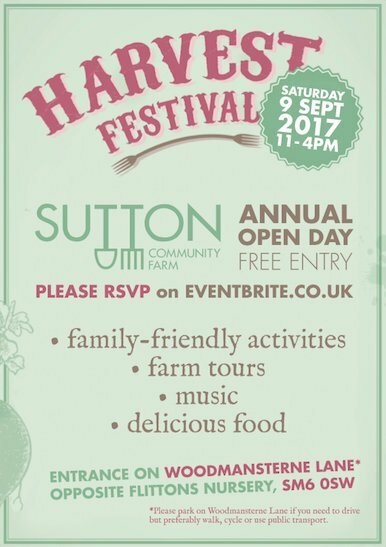 In September we invited everyone to the farm for our annual Harvest Festival. Harvest Festival games included sack races! And we took the opportunity to put together an impressive display of our veg. 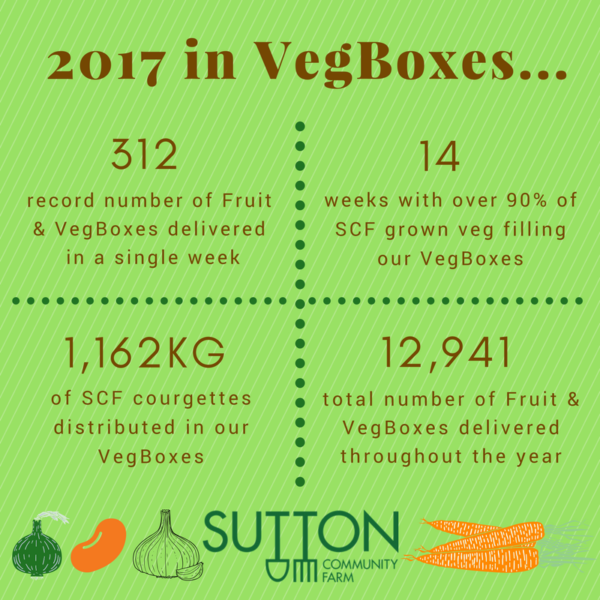 Customers of our VegBox scheme will recognise our bounty as we strive to send as much from our farm as we can to you each week. 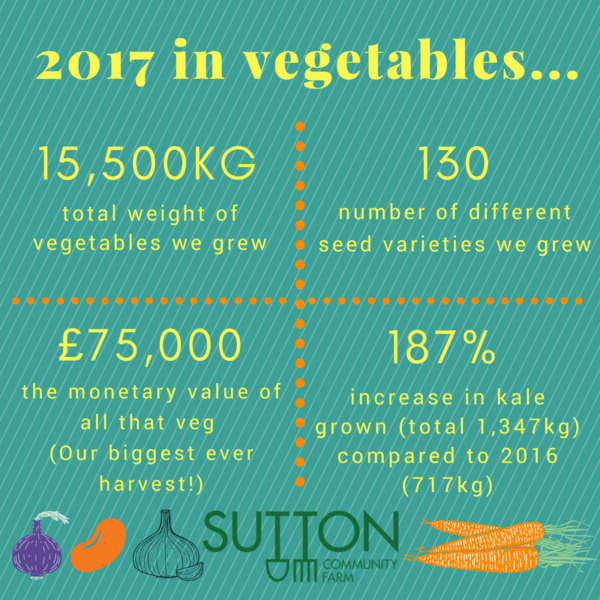 This year we are being supported by Power to Change’s Community Business Fund to grow the VegBox scheme – so far we’re doing well with customer numbers up by 28% in 2017 vs 2016. Well done Robyn and Pavlina! 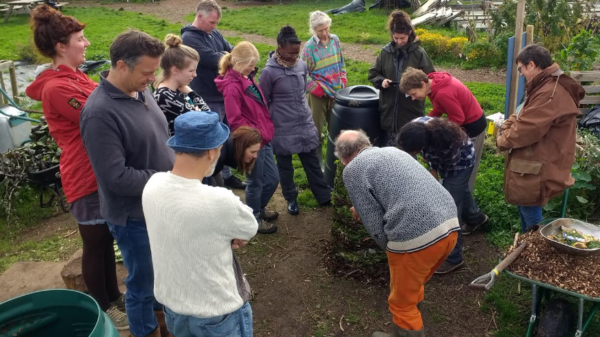 At our early October open day we hosted a comprehensive composting workshop, with Nicky Scott on hand to inspire and educate 15 keen composters who came down to the farm to discuss the multiple merits of turning “waste” into nutrient-rich soil which feeds our plants! The farm is now exploring ways in which we can incorporate more material into our compost heap – closing the loop where we can. Volunteers and staff celebrating the installation of our new fridge! 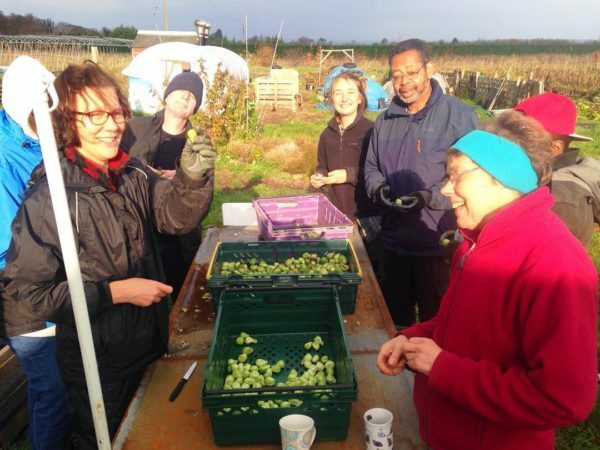 Beddington Community Benefit Fund enabled us to buy this much needed asset, allowing us to look after all that wonderful produce we harvest throughout the year. The growing season begins to wind down in Autumn and so too do some of the programmes we run on the farm. 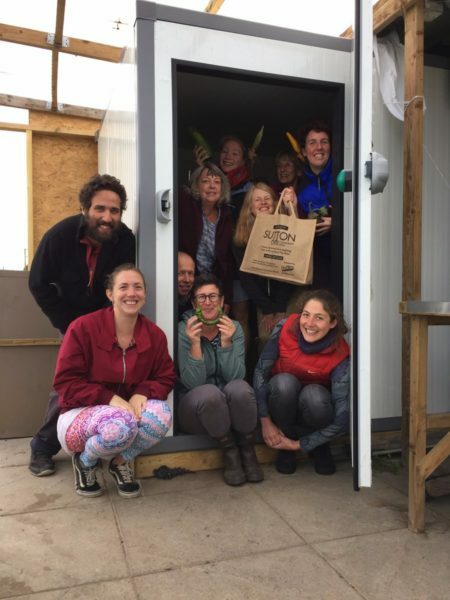 Our Sustainable Farming Assistants participants graduated from their six month training having learnt about all stages of crop production on the farm, as well as other projects relating to the development of the space. Thanks to all for your enthusiasm and hard work. We are also really grateful for the help of all the young people on National Citizen Service (NCS) and Headstart who came to volunteer on the farm over the summer. 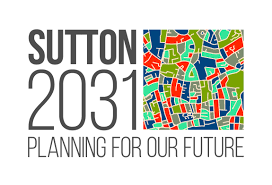 We participated in hearings for the Sutton Local Plan – the key planning document that sets out the vision for the development of the borough up to 2031. Following our representation the Council have suggested some modifications to the Plan in line with our recommendations. The modifications include a requirement for the Council to include ‘access to healthy food’ when assessing future planning applications; strengthening of support for the protection and provision of food growing spaces on new developments; specific mention of support for community food growing on Little Woodcote Estate and some protection for the Estate from non-agricultural development. 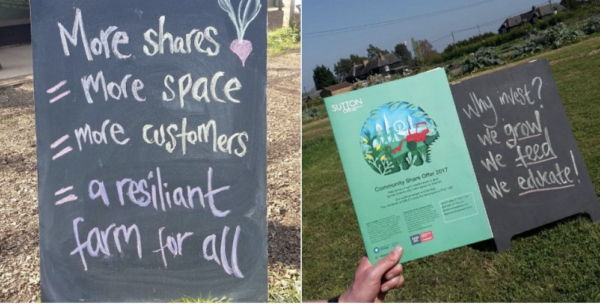 We felt that it was important for our voice to be heard at these important sessions and were pleased to collaborate with Ecolocal and Sustain on the final submissions. In October we received long awaited planning permission from Sutton Council for our new barn. We are now finalising the negotiations with Surrey County Council to secure a 15 year renewed lease. Once this is complete we can start the build. This winter, with more VegBoxes and volunteers than ever before, we are reminded of the need for our new barn on a weekly basis. We can’t wait to get digging! 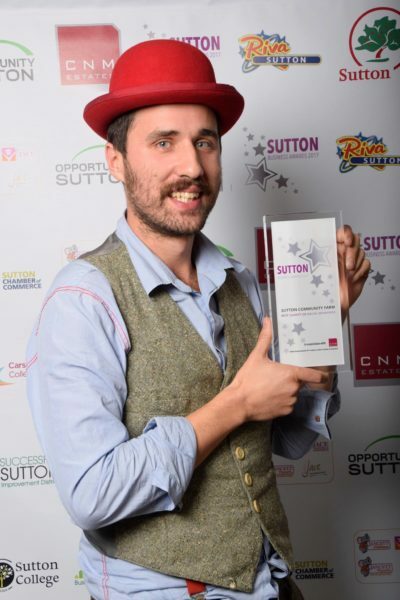 In November we won BEST CHARITY / SOCIAL ENTERPRISE at the Sutton Business Awards 2017. After seven years of hard work and collective effort by the team and our invaluable family of volunteers, it’s great to have such recognition. 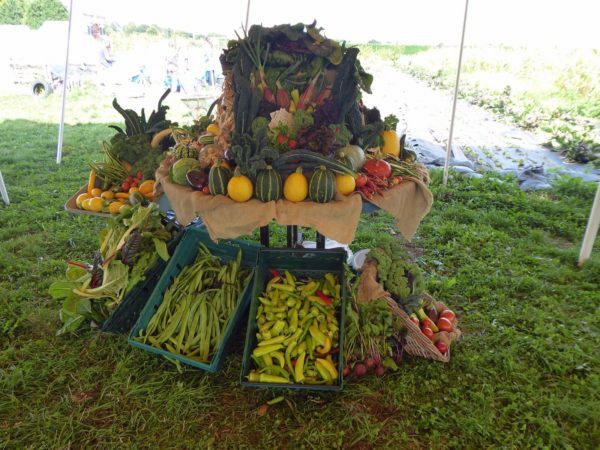 A big thank you to everyone who contributes to our community and our farm! Joris attended the ceremony to collect our award. The second year of our Grow Beer Sutton project culminated in a tasting session at the farm in October. Local brewer Andy made a delicious beer using the fresh hops harvested back in September. It’s not all good! 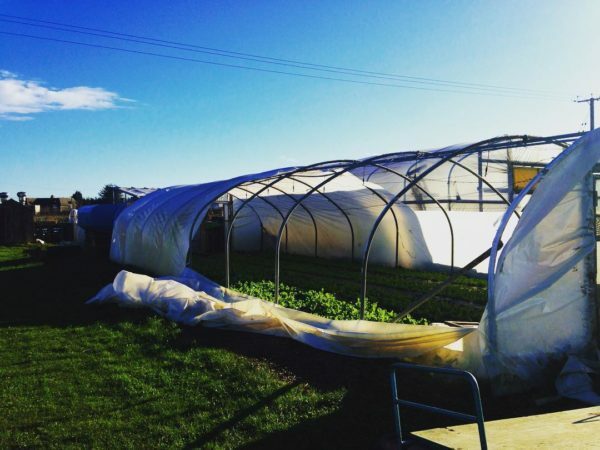 High winds at the end of November ripped the polythene off the oldest of our polytunnels. We’ve invested in a new covering and are waiting for a calm, dry day to repair the damage. We had fun in the last few weeks of December celebrating at the Christmas party with some of the many friends of the farm and the Wandle Ceilidh Band. The Brussels Sprouts planted back in March were harvested for our festive VegBoxes. As you can see production on the farm has been very successful with Joris, Rachel and Sam working hard. 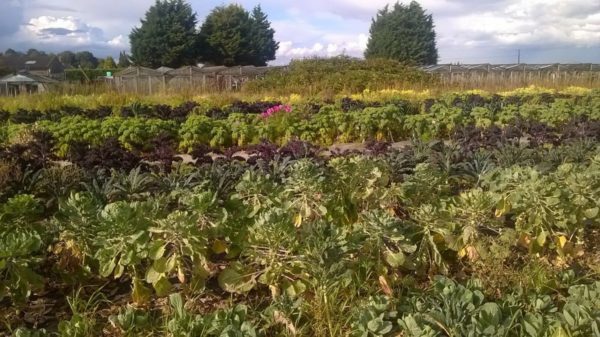 15.5 tonnes of vegetables from Sutton Community Farm is a fantastic result from our small site! This compares to 14.8 tonnes in 2016, 13.4 tonnes in 2015, and 10.8 tonnes in 2014. Our wholesale sales of salad and leafy greens to restaurants are exceeding all targets and due to the success and hard work of the growing team we’ve been able to offer Sam a position after her apprenticeship ended in November to focus on salad production. A job we’re delighted that she accepted! After nearly six years at the farm, I have decided to hand in my notice as General Manager and explore pastures new. It’s been a roller coaster ride from volunteer to Apprentice Grower in 2012, and General Manager since January 2016. It’s been an absolute privilege to work at the farm and the decision to leave has certainly not been easy. However, I feel that it’s time for me to move on and I shall be departing in Spring 2018. Heartfelt thanks to everyone and Happy New Year!